I've become a fan of natural products in the last few months. Safer, healthier, and Eco-friendly products is something that I am proud to use in my household, with children running around the house? Why wouldn't I want a safer environment for them? Recently, I contacted the company Nature's Gate and asked them if I could review a couple of their products. Nature's Gate agreed to providing me with two wonderful products to test out and review for my readers. Even more exciting, they have also agreed to sponsor a giveaway for one of the products that I am about the review. Two winners will be selected to receive a product that I have grown to love. Before I begin, I'd like to share the Nature's Gate Philosophy and Mission with you. I found it quite interesting and hope that you will as well. Please click on the link above to read the philosophy and mission of Nature's Gate. Did you know that they are also committed to raising awareness on clean water? You can read more about what they do and how you can help by "Joining Us In Giving The Gift Of Clean Water". I highly recommend reading the entire website at Nature's Gate to find interesting and important information on the company and other features. As I mentioned above, I had the opportunity in trying two wonderful products. 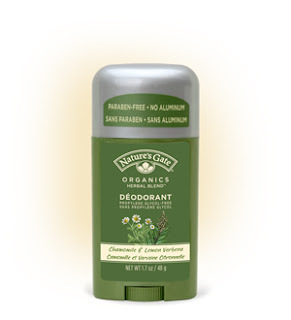 Chamomile & Lemon Verbena Deodorant Stick- This product arrived just in time for tedious task ahead...chores. First, I took a shower to cleanse off any other trace of deodorant that I had been wearing and applied this product to my underarms. This deodorant is a clear solid that glides on easily without leaving any light colored residue on your clothing. The scent is light yet, pleasant and not overpowering as some deodorant scents. I had spent hours cleaning and moving furniture around in my bedroom before completing the first "sniff test". My son was sitting there watching me as I raised my underarm to my nose and of course his reaction was "ewe mom!" as he wrinkled his nose up at me. The Chamomile & Lemon Verbena Deodorant Stick had passed it's first round. No disgusting odors and the scent was still there. I thought that I would have to replenish the deodorant but, I was wrong. Next, on to the next task...my closet! You might not think that this would be a big task but, have you seen my closet?! Boxes of odds and ends, magazines, clothing, pictures, and much more loaded my closet where you couldn't find anything. After spending another few hours cleaning, reorganizing, and distributing my clutter into various piles (Keep, toss, donate, etc.) I had performed yet, another sniff test which proved to be a desirable product. Conclusion? This deodorant is a keeper and at a mere cost of $5.99 for 1.7oz, I'll admit this is worth every penny and I am a frugal shopper. Pomegranate Sunflower Velvet Moisture Liquid Soap- This happens to be my favorite product out of both items that I tested. The scent is amazing and delicious. (NOT meant to be eaten) I quickly removed the liquid hand soap from my kitchen and replaced it with this bottle. I applied a small amount to my palms and lathered them until I felt it was time to rinse the soap from my hands. Honestly, it felt as if I was applying lotion and didn't want to wash them too quickly. I have grown to love this hand soap and have used it several times since it's arrival. I can feel a noticeable change in the texture of my hands, they seem to have become a little smoother since my usage after a week. I will definately keep this hand soap in mind for my next purchase. You too can purchase this liquid hand soap at $6.99 for 16 FL oz. This luxuriant soap creates ultra rich lather and is packed with antioxidants of Pomegrante, Acai and White Tea that help protect hands from the signs of aging. Infused with 7 Natural Moisture Boosters to hydrate so hands never feel dry after washing. Delivers great value, dispensing 250+ pumps (washes) per bottle. The products I have mentioned above in my review as well as several other Nature's Gate products are available for purchase online or you may utilize the store locator to find a retailer near you. Nature's Gate has generously offered to send two of my readers (1) one bottle of the Pomegranate Sunflower Velvet Moisture Liquid Soap. Please read the directions carefully before you enter. DISCLAIMER: I have not and will not be paid for this review. I had received a sample from the sponsor of this giveaway and I have only posted my own personal and honest opinion to share with other readers. I hold no responsibility between you and the company, and/or products you may purchase or receive from them. I think the Mango Lotion & Body Wash Gift Set sound lovely! I'd like to try the lavender and aloe lotion. I'd like to try the Hemp Moisturizing Lotion for Dry Dehydrated Skin. I've heard good things about hemp seed oil. The Mango Lotion and body wash would be nice. Thanks for the chance. I would like to try the Skin Therapy Lotion for Dry, Chapped, Cracked Skin. My skin gets really dry and cracked in the winter so this would be great to try. The Mandarin Orange & Patchouli Liquid Soap also sounds lovely to me. 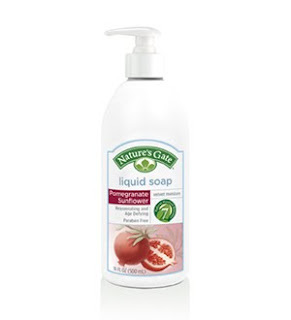 I would like to replace my Patchouli Kiss My Face Hand Soap with the Nature's Gate because my hand soap is too drying for me. Right now I'm using Method, and too much comes out at once, so I'd be interested to see how this fares in its stead. i am interested in the Mango Lotion and body wash. The clean scent of Lemongrass and Clary Sage Lotion appeals to me. The Light Switch Brightening Serum would be great for my thirsty, aging skin! I would like to try the Fruit Blends Deodorant, Mandarin & Patchouli scent. Thanks! I'd also love to try the Natural Results Acne Treatment Kit. I would love to try the Awapuhi Volumizing Shampoo for Fine, Limp Hair--thanks for the chance to win. The cucumber and mint body wash sounds like something I should try. Thanks for the opportunity to enter your contest and maybe win the pomegranite and sunflower liquid soap--that would be great on my bathroom counter. Would like to try the Herbal Daily Shampoo. I use various brands of hand soap, so would like to replace them with this to see how it matches up. I'd love to try the Mango Bodywash. I wouldn't mind trying the Rainwater Organics Bergamot Patchouli Lotion. I hope this is what you meant by the replacement question. I would love to try the Asian Pear & Red Tea Antioxidant Defense Lotion. I enjoyed this post!! I think that this company is great! I would like to try the Raspberry Mint Whitening Toothpaste w/ Fluoride. I'm interested in the tea tree calming shampoo! Mango body wash sounds nice! USDA Certified Rainwater Organics Orange Zest Mint Lotion is another product that I find to be interesting. the mandarin orange and patchouli soap sounds good! The Grapefruit & Wild Ginger Liquid Soap sounds good, too. USDA Certified Rainwater Organics Lemongrass Spice Lotion is one product that I would love to try. The warming and invigorating sensation would be nice for winter. I would like to try the Herbal Moisturizing Lotion for All Skin Types. Thanks. I tried Chamomile & Lemon Verbena Lotion and love it. I would love to get the Cucumber and mint creamy Shave Gel for my husband. It would be nice to smell something less artificial on his skin. The Mango Body Wash sounds yummy! Thanks! The In The Beginning Gentle Cleansing Lotion looks good. I like the Lavender & Aloe Lotion. I think I would like the Forget Your Lines Wrinkle Diffuser Serum. I would like to replace my Softsoap Elements hand soap with this. Mango Body Wash sounds great! I also am interested in their "Natural Results Corrective Cleansing Treatment for the Body"
I would like to try the Pomegranate Sunflower Velvet Moisture Body Wash. I am following and would like to add that I would also like to try the Colloidal Oatmeal Lotion For Itchy Dry Sensitive Skin since I didn't see that you wanted something not in the review. Would Love the Mango Lotion & Body Wash Gift Set. I like the Pomegranate Sunflower Hair Defense For color-enhanced hair. Mango Lotion & Body Wash Gift Set ALL THE WAY!!! Nature’s Gate Organics Natural Results Acne Care exclusively features Salicylic Acid, Oligopeptide-10 and Encapsulated Tea Tree Oil, to make acne a thing of the past. I would like the ginger tea body wash. I would replace my soft soap. I have always loved Tea Tree Oil Products so I would like to try the Tea Tree Calming Shampoo for Irritated, Flaky Scalps. The ginger tea body wash looks very nice! I signed up for the Nature's Gate newsletter.